Cover large platter with salad greens. Arrange next 7 ingredients in rows over greens. Mix dressing and salsa until blended; drizzle over salad just before serving. 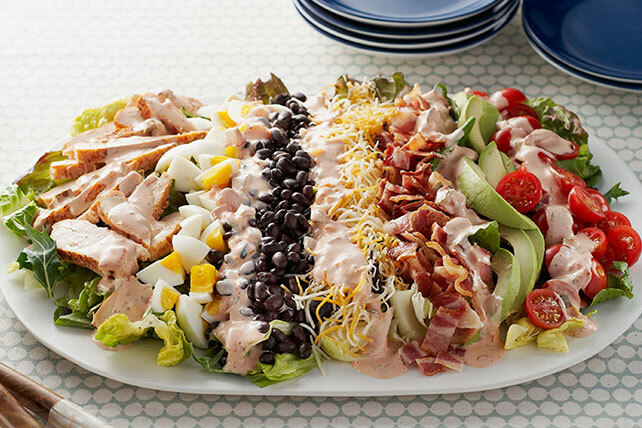 Southwestern flair is added to this classic salad that, at 14 servings, is large enough to serve a crowd. Sometimes referred to as hard-boiled, hard-cooked eggs are easy to prepare and aren't really "boiled." Place eggs in single layer in saucepan. Add water to completely cover eggs at least 1 inch. Bring to boil; cover. Remove from heat. Let stand 20 min; drain. Immediately run eggs under cold water to cool. To keep avocado slices from turning brown, toss them with 1 to 2 Tbsp. lemon or lime juice before adding to salad. If taking this salad to a party, it is best to have all the ingredients cut up, ready to go and placed in individual resealable plastic bags. Transport the ingredients in a cooler to keep everything nice and fresh. When you arrive at your destination, simply assemble the ingredients just before serving. This will keep things looking fresh and attractive. Substitute 1 drained 11-oz. can corn with red and green bell peppers for the rinsed black beans. A bit of chopped fresh cilantro sprinkled on the finished salad adds an extra hit of Southwestern flavor.